Everything has come together and you’ve finally be able to organize the family portrait. Your goal was to get 3 generations in one shot, and your parents and kids are ready to go. To make everything easier, you’ve decided to serve as photographer as well. As you’re looking through the camera at your whole family’s smile, you inevitably start thinking about their teeth. You wish you could take them all to the same dental practice so you know that they’re well taken care of. You can now get that reliability with Dr. Richard Fossum, your family dentist in Temple. He has a number ways he can keep your family smiling. The best way to take care of most dental issues is to stop them before they even start. This is why Dr. Fossum and his team can offer your family a variety of preventive services. These are tailored specifically to save you time and discomfort in the future. It all starts with a basic dental cleaning, which is able to clean trouble spots in your mouth that you can’t reach with brushing and flossing alone. A regular check-up can also help Dr. Fossum catch any dental issue you might have early, ensuring treatment will be simple. This will help you and your family stay out of the dentist’s chair more than you need to. He even has methods for treating snoring and nighttime teeth grinding (also known as bruxism). Whenever one of your teeth have become damaged due to decay or injury, the structure needs to be prepared so that the tooth can look and function normally. Tooth-colored fillings are able to accomplish this with teeth that have small cavities. They can repair your tooth while seamlessly blending in with your smile. For teeth that need more attention, you can even get a crown in one-day thanks to our use of the latest technology. This digital approach to fabricating crowns is not only faster, but gives you a higher-quality result as well. With Dr. Fossum, even the dreaded root canal is a painless procedure that helps relieve discomfort, not cause it. People with completely missing teeth can even have them replaced using a bridge or dental implants. No matter what condition your family’s teeth are in, we are able to help them. If you just want your smile to look a little better, we can help you there as well. Take away years of stains and let your teeth shine with teeth-whitening. You can fix a variety of cosmetic issues at the same time with a set of porcelain veneers. They help strengthen your teeth while making them look more beautiful at the same time. If you are looking to simply straighten your teeth without the hassle of braces, you can always try Invisalign. 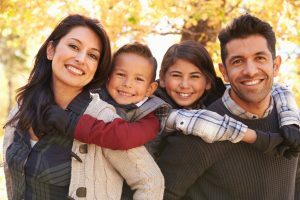 All of these procedures can make sure that not only are your family’s smiles healthy, but that they look fantastic as well. If you would like to know more about how Dr. Fossum and his team can help your family, please give us a call today. He’ll be more than happy to talk to you and let you know he should be your dentist in Temple.